Sometimes everything does not go as you planned. Your best-laid plans may not work out, some tools might break, or wires might get crossed – all such possibilities always exist. In these situations, it is essential that you know what went wrong, so you can avoid the issue in the future. Occasions such as these are when you need to use ‘The 5 Whys’ – an exceptionally effective but simple process for performing the root cause analysis of an issue. Basically, the process is based on discussing an issue, a challenge, or an unexpected event to follow a chain of thoughts that takes you to the nature and cause of the problem. So, what are the 5 Whys and how does the process work? The technique was introduced and improvised by Toyota Motor Corporation. It is a strategic and vital component of the problem-solving regime for the company. Taiichi Ohno, the architect for the company in the 1950s, has explained the 5 Whys process in his publication ‘Toyota Production System: Beyond Large-Scale Production’. He describes the 5 Whys as the basis of the scientific approach taken up by Toyota – he states that by repeating the question ‘why’ five times, the nature and the solution of a problem become clear. He further encouraged teams to explore all the issues that are encountered by asking ‘why’ five times, so that the root cause (and an appropriate solution) for each problem can be reached. The 5 Whys method is carried out by arranging meetings right after a problem has been encountered by the company. The problem can belong to multiple categories – it can be a development error, missed schedules, marketing campaign failure, or a site outrage. Whenever something undesired comes up, you can use this process for analyzing the root cause of the issue. Before you can start, you should understand that the 5 Whys are not a tool to find someone to blame, but to understand why something unwanted or unexpected happened. Moreover, it can help the company in taking a few steps and making a few changes to ensure that the same problem doesn’t happen again. You’re supposed to go down five levels into the problem using the 5 Whys. Even though this seems to be the easiest part of the process, it can be a bit complex. If you start off correctly, the rest of the things are more likely to fall in place. Hence, the key is to get the first why right. While conducting this method, you may feel that would be beneficial to dig down into all the possible paths and analyze each extensively. This, however, can add a lot to the list of things that have to be learned and corrected. The 5 Whys is a ‘lean’ process, therefore it must allow us to pick one path and carry out just the required corrective measures in order to solve an issue. Hence, a lot of times you will have to pick just one out of multiple paths, and stick with it. In case the problem reoccurs, then you can opt another route for solving it. It is important that you share this information and the process results with the entire team. This is because it provides everyone with an insight about what types of problems the company is facing, and how they can be solved. With a certain analysis, it will be easier for the staff to understand exactly why the company is putting in some time to solve an issue rather than introducing new features. In case this step creates an argument, that is something positive too because it tells you that there is a problem because either your team does not understand what you are doing and why it is important, or your analysis is not conclusive enough. You will have to determine where exactly the loophole is and then fix it. Once the exercise of the 5 Whys has been performed, pair up every question with and answer and determine 5 relevant ‘corrective actions’ that everyone agrees upon. These actions will make up the solution for the issue that is being analyzed. The leader for this activity should then assign relevant responsibilities to different members of the team/company for implementing the solution. Why are the customers being shipped products with wrong specifications? Because the products were manufactured to specifications that were different from what the sales team and the customer agreed upon. Why were the products manufactured with different specifications than those agreed upon by the sales team? Because the sales team expedites its work by directly contacting the head of manufacturing for starting to build the products. An error was made in the communication between the sales person and the head of manufacturing which led to the wrong specifications being noted down. Why did the sales person contact the head of manufacturing directly instead of following the company’s standard procedure? Because the ‘start manufacturing’ form in the company requires the approval of the sales director before the work can begin – this slows down the process of manufacturing and would lead to a delay in shipping to the customers. Why does the form require the approval of the sales director? Because the director needs to be continuously updated with the sales/manufacturing details for discussion with the company’s CEO. In this scenario, only four Whys were required to determine the root cause of the problem – the non-value added approval (signature) of the sales director is causing a breakdown in the manufacturing process. The company can now come up with a solution for ensuring that there is no delay in the manufacturing process without the sales person having to directly contact the head of manufacturing. Note that like in this case, you may reach the cause of your issue in either less than five Whys or more than five Whys – just remember to keep asking why until you have determined the root of the problem. 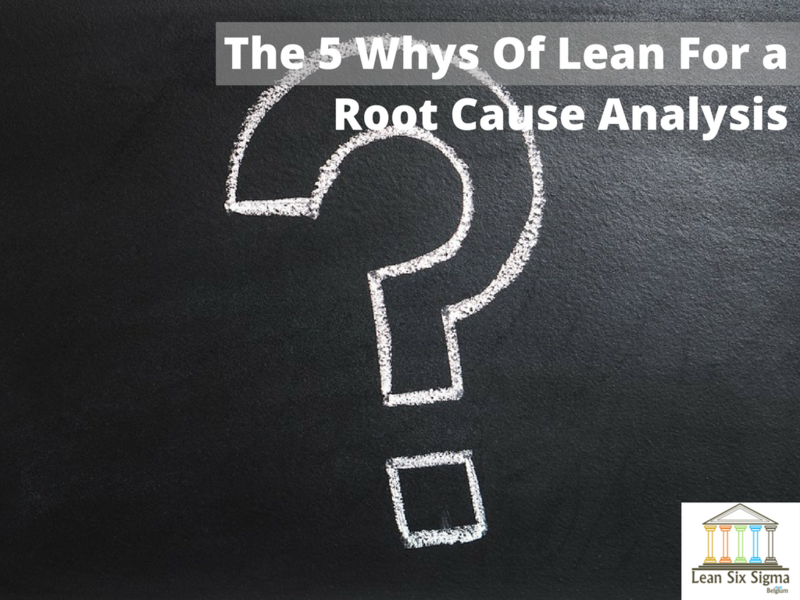 The 5 Whys are a lean technique for determining the root cause of an issue. For conducting the 5 Whys process, you must first ask the question ‘why’ five times and then pair each question and answer to draw up the corrective actions that your company needs to perform. After you have determined the root cause of the issue and its corrective actions, you must convey the results to your entire team and assign responsibilities to relevant individuals for solving the issue.